Wool fibre takes only a small fraction of the energy used to produce synthetic fibre. Wool is a natural fibre and low in toxins and odours (VOCs). Wool is naturally fire resistant, no need for flame retardant additives. Wool has high level of insulation capacity - great for carpets and rugs - sound proof insulation for noise reduction. 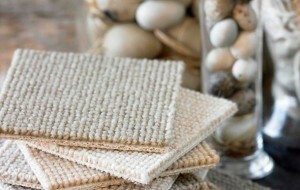 Wool has a natural water resistance - water beads on top of fibres, great attribute for carpets and soft furnishings. Natural wool is a renewable resource and biodegradable. Wool is a soft comfortable fibre. Wool has a unique crimp structure which gives it natural bounce and durability - natural cushioning. Wool acts as a filter, helping to clean the air within the space - wool is able to remove formaldehyde from indoor air. Wool fibre breathes which allows the fibre to dry when wet - minimising potential for mold. Wool is easily accessible in many colours and textures. Is your babies nursery toxic ?